Palestinian leader Mahmoud Abbas has welcomed news that the Hamas militant organisation plans to take part in the July parliamentary election. 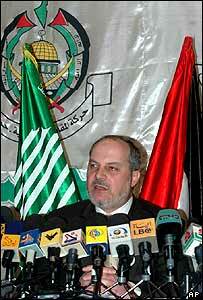 He told reporters that the move would contribute to the participation of all Palestinians in political life. Hamas said it was a way of stopping the mainstream Palestinian grouping, Fatah, from dominating the political scene. A spokesman said Hamas would not become a political party or give up its military campaign against Israel. Hamas boycotted the first Palestinian parliamentary election in 1996 but won overwhelming victories in local elections in the Gaza Strip in January. In another development, United Nations Secretary General Kofi Annan is due to visit the Middle East on Sunday for talks about the peace process, beginning with a meeting with Israeli Prime Minister Ariel Sharon. Israel's plans to withdraw from the Gaza Strip are likely to come up for discussion both with Mr Sharon on Sunday and Mr Abbas on Monday, the BBC's James Reynolds reports from Jerusalem. Mr Abbas said the entry of Hamas into the election race was a "good step" but "not really a surprise" since the group had taken part in the local elections. Hamas beat Fatah - the traditional party of power founded and led by the late Yasser Arafat - convincingly in those polls. Mohammad Ghazal, a Hamas political leader, told reporters that the group had still not decided on whether to be a part of the Palestinian government and whether to hold talks with Israel in the future. He stressed that the group still regarded "resistance as a strategic choice". Hamas has spent years building up a considerable following. It operates a social programme, like building schools, hospitals and religious institutions, as well a military wing that has been behind many of the suicide bomb attacks against Israelis.